There is no entrenched law that forms the New Zealand constitution. The Constitution Act 1986 and a collection of statutes (Acts of Parliament), the Treaty of Waitangi, Orders in Council, letters patent, decisions of the Courts and unwritten constitutional conventions, comprises only a portion of the uncodified constitution of New Zealand. New Zealand is a constitutional monarchy with a parliamentary system of government. This system is based on the Westminster system, although that term is increasingly inapt given constitutional developments peculiar to New Zealand. The head of state, the monarch of New Zealand is represented in the Realm of New Zealand by the Governor-General and is the source of executive, judicial and legislative power. The Constitution Act 1986 describe the three branches of Government in New Zealand: The Executive (the Executive Council, as the Cabinet has no formal legal status), the legislature (the House of Representatives and Sovereign in Parliament) and the judiciary (Court system). New Zealand is a constitutional or limited monarchy. The underlying principle is democracy, with political power exercised through a democratically elected parliament – this is often stated as "The Queen reigns but the government rules so long as it has the support of the House of Representatives." The monarchy of New Zealand has been legally distinct from the British monarchy since New Zealand ratified the Statute of Westminster 1931 with the Statute of Westminster Adoption Act 1947 in 1947. The British Crown and New Zealand Crown are thus legally distinct. Part one of the Constitution Act 1986 describes "The Sovereign", the reigning monarch, as New Zealand's head of state. Section 2(1) of the Act declares "The Sovereign in right of New Zealand" as head of state, and section 5(1) describes the Sovereign's successor as being "...determined in accordance with the enactment of the Parliament of England intituled The Act of Settlement". This means that the head of state of the United Kingdom under the Act of Settlement 1701 is also the head of state of New Zealand. Under the Imperial Laws Application Act 1988, however, the Act of Settlement is deemed a New Zealand Act, which may be amended only by the New Zealand Parliament. There have occasionally been proposals to abolish the monarchy and establish a republic. Unlike its neighbour Australia, New Zealand has not yet held a referendum on the matter, but a number of prominent politicians (including the current Prime Minister, John Key) believe that an eventual move to republicanism is inevitable. Opinion polls however have shown that a majority of New Zealanders favour keeping the monarchy. The Sovereign's representative in and over the Realm of New Zealand is the Governor-General. The Office is largely ceremonial, although the Governor-General holds a number of so-called 'reserve powers'. The Office is nominally non-partisan, the Prime Minister advises the Sovereign who to appoint as the Governor-General. Increasingly, the Governor-General represents New Zealand abroad and is accorded the same respect and privileges of a head of state. It can be argued that the de facto head of state is the Governor-General while the de jure head of state remains the Sovereign. The current Governor-General is His Excellency Lieutenant-General the Right Honourable Sir Jerry Mateparae, GNZM, QSO. The Head of Government of New Zealand is the Prime Minister. The Cabinet, which is responsible to Parliament, exercises executive authority. (The Cabinet forms the practical expression of a formal body known as the Executive Council.) The Prime Minister, as the leader of the political party or coalition of parties holding or having the support of a majority of seats in the House of Representatives, leads the Cabinet. All Cabinet Ministers must be Members of Parliament (MPs) and are collectively responsible to it. New Zealand has a unicameral Parliament, the House of Representatives, which has at least 120 Members. Since 1996, New Zealand has used the Mixed Member Proportional (MMP) system, which is essentially proportional representation with single member seats (that can affect the proportionality of the House, but only to a limited degree). Seven seats are currently reserved for members elected on a separate Māori roll. However, Māori may choose to vote in and to run for the non-reserved seats, and several have entered Parliament in this way. Parliaments have a maximum term of three years, although an election can be called earlier. In New Zealand, everyone (male and female) aged 18 years and over can vote, with the exception of some prison inmates. Women gained the vote in 1893, making New Zealand the first self-governing country in the world to support Women's suffrage. New Zealand's judiciary is a hierarchy consisting of the Supreme Court of New Zealand, the Court of Appeal of New Zealand, the High Court of New Zealand, and the District Courts. These courts are all of general jurisdiction. There are several other courts of specialist jurisdiction, including the Employment Court, the Environment Court and the Māori Land Court, as well as the Family Court and the Youth Court, which operate as specialised divisions of the District Courts. There are also a number of specialised tribunals which operate in a judicial or quasi-judicial capacity, such as the Disputes Tribunal, the Tenancy Tribunal and the Waitangi Tribunal. New Zealand law has three principal sources: English common law; certain statutes of the United Kingdom Parliament enacted before 1947 (notably the Bill of Rights 1689); and statutes of the Parliament of New Zealand. In interpreting common law, there is a rebuttable presumption in support of uniformity with common law as interpreted in the United Kingdom and related jurisdictions. Non-uniformity arises where the New Zealand courts consider local conditions to warrant it or where the law has been codified by New Zealand statute. The maintenance of the Privy Council in London as the final court of appeal and judges' practice of tending to follow British decisions, even though, technically, they are not bound by them, both bolstered this presumption. The Supreme Court of New Zealand, which was established by legislation in October 2003 and which replaced the Privy Council for future appeals, has continued to develop the presumption. Judgment was delivered on 3 March 2015 in the last appeal from New Zealand to be heard by the UK Judicial Committee of the Privy Council. The Treaty of Waitangi is an increasingly important source of constitutional law in New Zealand. The constitutional place of the Treaty of Waitangi is a subject of much debate. Increasingly, the Treaty is seen as an important source of constitutional law. Indeed, references to the "Principles of the Treaty of Waitangi" appear in a number of statutes, although the principles themselves have not been defined in statute. They are instead defined by a common law decision of the Court of Appeal from 1987, the famous "Lands case" brought by the New Zealand Māori Council (New Zealand Maori Council v Attorney-General). There was great concern within Māoridom at that time that the ongoing restructuring of the New Zealand economy by the then Fourth Labour Government, specifically the transfer of assets from former government departments to State-owned enterprises. Because the state-owned enterprises were essentially private firms owned by the government, they would prevent assets which had been given by Māori for use by the state from being returned to Māori by the Waitangi Tribunal. The Māori Council sought enforcement of section 9 of the State Owned Enterprises Act 1986 "Nothing in this act shall permit the Crown to act in a manner that is inconsistent with the principles of the Treaty of Waitangi". The text of the Treaty itself is included in the Treaty of Waitangi Act 1975, an act which established the Waitangi Tribunal to determine issues of breaches of the Treaty. The Act was initially prospective, but was later amended in 1985 so that claims dating from the signing of the Treaty could be investigated. The 1985 amendment also included the Māori text of the Treaty for the first time. The New Zealand Bill of Rights Act 1990 sets out the civil and political rights of New Zealand citizens against the three branches of government and entities and persons exercising public functions. The Act is not entrenched or supreme law, and can in theory be amended by Parliament by a simple majority but may be subject to an emerging constitutional convention that requires general support for any material change. Prior to European Settlement of New Zealand, Māori society was based largely around tribal units with no national governing body. As contact with Europeans increased, there arose a need for a single governing entity. In 1788, the colony of New South Wales was founded. According to Governor Phillip's amended Commission dated 25 April 1787, the colony included "all the islands adjacent in the Pacific Ocean" and running westward on the continent to the 135th meridian east. Until 1840, this technically included New Zealand, but the New South Wales administration had little interest in New Zealand. Amid increasing lawlessness and dubious land transactions between Māori and Europeans, the British Colonial Office appointed James Busby as British Resident to New Zealand. Busby convened the Confederation of Chiefs of the United Tribes of New Zealand, which adopted the Declaration of Independence of New Zealand at Waitangi in 1835. While this Declaration was acknowledged by King William IV, it did not provide a permanent solution to the issue of governance. In 1839 Letters Patent were created purported to extend the jurisdiction of the colony of New South Wales to New Zealand, in effect to annexe "...any territory which is or may be acquired... within that group of Islands known as New Zealand". This strategem was adopted by the Colonial Office in order to allow time for Captain William Hobson to legally acquire sovereignty from the United Tribes of New Zealand by Treaty. 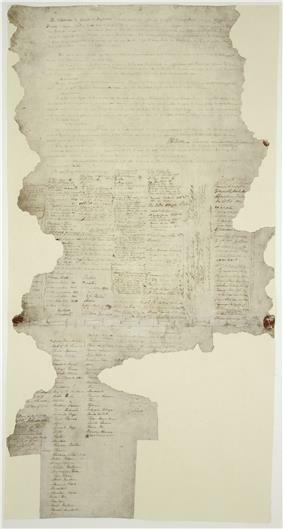 On 6 February 1840, the first copy of the Treaty of Waitangi (Te Tiriti o Waitangi) was signed at Waitangi. Several subsequent copies were signed at various places around the North and South Islands. On 21 May Hobson issued proclamations of British Sovereignty over New Zealand. The basis of the proclamations was Hobson's discovery of 'treasonable' activities of the New Zealand Company settlements in Port Nicholson (Wellington and Britannia, later Petone) establishing their own 12-member governing council. Hobson sought to prevent the establishment of what he saw as a 'republic', that is, an independent state outside of his jurisdiction. Hobson was then declared Lieutenant-Governor of New Zealand and divided the colony into two provinces (North Island—New Ulster, South Island—New Munster) after the Northern and Southern Irish provinces. In 1841, New Zealand was established as a colony in its own right. The Imperial Parliament (Westminster) passed the first George Grey, declined to apply it for a number of reasons. Instead, the Act was suspended for five years. Grey ruled with the powers of a dictator for the next five years; appointing Provincial councils at his pleasure. Following the suspension of the 1846 Act, the Imperial Parliament moved again to grant New Zealand self-government with the New Zealand Constitution Act 1852, which repealed the earlier Constitution Act. This Act was based almost entirely on a draft by Sir George Grey, the main difference being the appointment of the Governor by the Secretary of the Colonies, and not by the (New Zealand) House of Representatives. The new Act did not take effect in New Zealand until 1853. An Executive Council consisting of the Governor and Ministers. The first enactment of the first Parliament of New Zealand elected under this Act was the English Laws Act of 1854, which affirmed the application of all English statutes in existence as at 14 January 1840 to New Zealand; specifically the Bill of Rights 1689, and Habeas Corpus. The powers of the New Zealand Parliament were clarified by the Colonial Laws Validity Act (Imperial) of 1865, which allowed a measured amount of legal independence. Under the Act, the New Zealand Parliament could pass laws inconsistent with British statutes or the common law, so long as Imperial statute was not specifically applicable to New Zealand. Where this occurred, the New Zealand statute would be void. In 1857 the Parliament of the United Kingdom passed the New Zealand Constitution Amendment Act 1857, which allowed the New Zealand Parliament the ability to amend certain parts of the 1852 Act. This mainly related to proposals for new provinces in New Zealand. Several new provinces were then created by the New Zealand Parliament. The first major repeal of part of the Act came in 1876 with the Abolition of Provinces Act, which repealed section 2 of the Act and abolished the Provinces from 1 January 1877, thus centralising New Zealand’s government in its bicameral Parliament. In 1891 the composition of Legislative Council was changed, Councillors were no longer appointed for life; instead for terms of 7 years with provision for reappointment. The Imperial Conference of 1907 resolved to allow certain colonies to become independent states, termed 'Dominions'. Following the Conference, the House of Representatives passed a motion requesting that King Edward VII "take such steps as he may consider necessary; to change New Zealand's official name from 'The Colony of New Zealand' to 'The Dominion of New Zealand'. Prime Minister Sir Joseph Ward prompted to move to "…raise up New Zealand" and assured that it would "have no other effect than that of doing the country good". On 9 September, a Royal Proclamation granting New Zealand Dominion status was issued by King Edward VII. The proclamation took effect on the 27 September. As a result, the Office of Governor became Governor-General under the Letters Patent 1917 to reflect New Zealand's status as a dominion more fully. The Letters Patent also removed a number of powers the Governor previously held while New Zealand was a colony. In 1908, two enactments of constitutional importance were passed: the Judicature Act, which describes the Jurisdiction of the New Zealand Judiciary; and the Legislature Act, setting out the powers of Parliament. The latter is now largely repealed, with only certain provisions that codify aspects of parliamentary privilege remaining. The Imperial Conference of 1926 affirmed the Balfour Declaration of 1926, which stated Britain's Dominions were "equal in status". In respect of the Governor-General, the Declaration stated that they held: "the same position in relation to the administration of public affairs in the Dominion" as was held by the monarch in the United Kingdom. The Governor-General was thus bound by the advice of their responsible ministers. To give effect to the 1926 conference declarations, the Statute of Westminster 1931 was passed thus lifting the restrictions created by the Colonial Laws Validity Act 1865. The Statute applied to New Zealand but would have to be adopted by the New Zealand Parliament as its own law to have application in New Zealand. After much debate, this occurred in 1947 with the Statute of Westminster Adoption Act. At the request of the New Zealand Parliament, Westminster passed the New Zealand Constitution Amendment (Request and Consent) Act 1947 to grant the New Zealand Parliament gained full sovereign powers to amend or repeal the New Zealand Constitution Act 1852. The Parliament of the United Kingdom could still pass laws at the request of the New Zealand Parliament, however. This residual power, which was used only for the 1947 Amendment Act, was abolished with the passing of the Constitution Act 1986, which repealed the 1852 Constitution Act. As a result of these changes, New Zealand became a "Realm" legally independent of the United Kingdom, with a legally separate Crown. It was not until the 1983 Letters Patent, the first amendment of the Letters Patent since 1917, that New Zealand was correctly described as the Realm of New Zealand, which includes the self-governing territories of the Cook Islands and Niue. On the election of a National Government promising to abolish the Legislative Council in 1950, the Council was stacked with the so-called "suicide squad" to allow the passage of the Legislative Council Abolition Act 1950 by the House of Representatives to abolish the Upper House. Despite proposals to re-establish an upper house, notably Jim Bolger's Senate proposal in 1990, New Zealand's Parliament remains unicameral. In 1960 the Constitutional Society for Economic Freedom and Justice (CSEFJ) was formed to advocate a written constitution, restoration of the upper house of Parliament and a Bill of Rights. The society presented a petition to Parliament for a written constitution in 1961. Following the election of the Fourth Labour Government in 1984, a constitutional crisis arose. The incumbent Prime Minister Sir Rob Muldoon refused to implement the instructions of Prime Minister-elect David Lange to devalue the New Zealand dollar to head off a speculative run on the dollar. The crisis was resolved once Muldoon relented three days later, under pressure from his own Cabinet, which threatened to install Deputy Prime Minister Jim McLay in his place. Along with this Act, Parliament also passed the Imperial Laws Application Act 1988 to clarify which Imperial and English Acts are to apply to New Zealand. The Labour government also passed the Treaty of Waitangi Amendment Act 1985, which amended the previous Labour government's Treaty of Waitangi Act 1975, which put the Treaty of Waitangi in statute for the first time and created the quasi-judicial Waitangi Tribunal to address alleged breaches of the Treaty of Waitangi. The 1985 amendment included the Māori version of the Treaty (Te Tiriti o Waitangi) in statute for the first time and empowered the Waitangi Tribunal to consider claims dating back to 1840. The fourth Labour government also began the process of electoral reform. It convened the Royal Commission on the Electoral System in 1986. The Commission suggested New Zealand change to the Mixed-Member Proportional ('MMP') electoral system. Two referendums were held during the 1990s on the issue, with MMP being adopted in 1993 and implemented in 1996. The last major constitutional reform of the fourth Labour Government was the New Zealand Bill of Rights Act 1990. This Act puts New Zealand’s commitment to the 1977 International Covenant on Civil and Political Rights (ICCPR) into effect in New Zealand Law. However, the Act is neither entrenched nor supreme law (as was mooted in the White Paper of 1985) and can be repealed by a simple majority of Parliament. Because it is not supreme law, the constitution is in theory comparatively easy to reform, requiring only a majority of Members of Parliament to amend it, as illustrated by the abolition of the Legislative Council in 1950. Certain aspects of the constitution are entrenched, after a fashion. Section 268 of the Electoral Act declares that the law governing the maximum term of Parliament (itself part of the Constitution Act), along with certain provisions of the Electoral Act relating to the redistribution of electoral boundaries, the voting age, and the secret ballot, may only be altered either by three-quarters of the entire membership of the House of Representatives, or by a majority of valid votes in a popular referendum. Section 268 itself is not protected by this provision, so a government could legally repeal Section 268 and go on to alter the entrenched portions of law, both with a mere simple majority in Parliament. However, the entrenchment provision has enjoyed longstanding bipartisan support, and the electoral consequences of using a legal loophole to alter an entrenched provision would likely be severe. Further, and even though not subject to legislative entrenchment, material change to other aspects of the constitution is unlikely to occur absent broad-based support, either through broad legislative agreement or by referendum. A poll by TVNZ in 2004 found 82% of those surveyed thought New Zealand should have a "written constitution". There is no requirement for a referendum to enact constitutional change in New Zealand, except for the electoral system and term of parliament. However, there have been several referendums in New Zealand's history, most recently to decide the nature of electoral reform in New Zealand. Many groups advocate constitutional reform by referendum, for example New Zealand Republic supports a referendum on a republic. The Privy Council as New Zealand's highest court of appeal was replaced by the Supreme Court of New Zealand by a simple Act of Parliament despite calls from New Zealand First, National and ACT for a referendum to be called on the issue. The Citizens Initiated Referenda Act 1993 allows for non-binding referendums on any issue should proponents submit a petition to Parliament signed by 10% of registered electors. In 1999 one such referendum was held, on the question of whether the number of Members of Parliament should be reduced from 120 to 99. Electors overwhelmingly voted in favour of the proposal. However, there were no moves to amend the Electoral Act 1993 in line with this result until 2006 when a bill was introduced by New Zealand First MP Barbara Stewart to reduce the size of Parliament to 100. The bill passed its first reading by 61 votes to 60, but was voted down at its second reading after it was recommended by Select Committee that the bill be dropped. The lack of implementation of referendums has led to calls for such referendums to be made binding on the government of the day, similar to the direct democracy seen in Switzerland. Both the New Zealand First Party and the Kiwi Party advocate binding referendums, along with the Better Democracy group. However, neither are currently represented within the New Zealand Parliament, and current New Zealand Prime Minister John Key opposes binding referenda, as do many legal academics and members of New Zealand's LGBT communities. e) the processes which it would be appropriate for New Zealand to follow if significant constitutional reforms were considered in the future. 3. That the government consider whether an independent institute could foster better public understanding of, and informed debate on, New Zealand's constitutional arrangements. On 2 February 2006, the Government responded to the report of the Committee. The Government responded favourably to the first and second recommendations, but did not support the third recommendation. In December 2010, a Constitutional Review was announced as part of the confidence and supply agreement between the National Party and the Māori Party, starting in 2011. An advisory panel which will support the ministers Bill English and Pita Sharples, who will make a final report to Cabinet by the end of 2013. The Government will respond within six months. The ministers' first report to Cabinet – agreed on the make-up of the advisory panel, a plan for public engagement and how the review will interact with other government projects with a constitutional dimension, such as the referendum on MMP. On 4 August 2011 the make-up of the advisory committee was announced, with former Ngai Tahu leader Sir Tipene O'Regan and former law professor and law commissioner John Burrows as co-chairs. Cabinet Manual 2008 Conventions Describes the conventions of the constitution. Constitution Act 1986 Statute Describes the three branches of government. Replaced the New Zealand Constitution Act 1852. Electoral Act 1993 Statute Describes the election of Members of Parliament. Imperial Laws Application Act 1988 Statute Incorporates important British constitutional statutes into New Zealand Law, including Magna Carta, Bill of Rights (1689), Act of Settlement 1701. Judicature Act 1908 Statute Describes the Jurisdiction of the New Zealand Judiciary. Letters Patent constituting the office of Governor-General of New Zealand 1983 Letters Patent Describes the powers of the Monarch, constitutes the office of the Governor-General and the Executive Council. New Zealand Bill of Rights Act 1990 Statute Enumerates the Rights of Citizens against the state; enacts into law some of New Zealand's obligations under the International Covenant on Civil and Political Rights. Supreme Court Act 2003 Statute Ends appeals to the Judicial Committee of the Privy Council and establishes the Supreme Court of New Zealand as New Zealand's final court of appeal. Treaty of Waitangi 1840 Treaty A Treaty between Māori chiefs and the British Crown. ^ a b "PM playing down constitutional review". 14 November 2004. ^ "Section 271 Electoral Act 1993". Legislation.govt.nz. ^ "Electoral Commission – Referendums". ^ "National refuses to take part in constitution review". The New Zealand Herald. 14 November 2004. Retrieved 16 January 2008. ^ "Final Report of the Constitutional Inquiry" (PDF). 11 August 2005. ^ a b "Monarchy debate off-topic in constitutional review". ^ Good mix' in constitutional panel"'". The New Zealand Herald. 4 August 2011. Retrieved 8 August 2011. Better Democracy – Group advocating binding citizens-initiated referendums.